Life Cycle: Friday the 13th whereabouts! According to CNN, between 17 and 21 million people suffer from paraskavedekatriaphobia, or fear of Friday the 13th. As today marks the third Friday the 13th in 2009, one may consider packing an extra vile of holy water in their pockets, avoiding ladders and taking extra caution near mirrors. Mid-Day: "It's a common belief to beware of Friday the 13th, but most Mumbaikars are not particularly worried that today is one such day." About.com: "The sixth day of the week and the number 13 have foreboding reputations said to date from ancient times, and their inevitable conjunction from one to three times a year portends more misfortune than some credulous minds can bear. 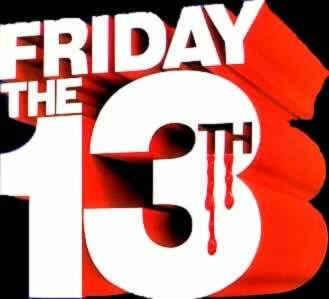 Here's why..."
Island Crisis: "The fear of Friday 13th is simply called Paraskevidekatriaphobia and the fear of the number 13 in overall is called Triskaidekaphobia. Save the words for a future use, you never know when you might need them. Well I said “simply” but maybe noting them in your diary will the best idea." Is FRIDAY the 13th really that unlucky day? Well, I can't blame the people who have fears in such date... The only thing I could blame for is the MEDIA itself and people who tend to deal with it in EXAGGERATION. Number 13 and Friday would not have been that so unlucky to perceive not until the horror movie FRIDAY the 13th starring Jason Vorhees as the killer appeared in the late 80s. It is then coupled with series of published books and articles of the related buzz. People began to somehow thought FRIDAY as unlucky and bad since Jason tends to kill during this day and several accidents occur also. After that, the what you so-called as "CO-INCIDENCE SYNDROME" where people tend to reconnect things and think that all bad stuffs happen on Friday the 13th. They tend to exaggerate various scenarios as people with the same unlucky experiences during this day share their thoughts. Thus, creating a WORLDWIDE fuzz about such. If only, FRIDAY could speak on its behalf... It would defend itself on the court and would sue LIBEL to the millions of people who have these misconceptions. Well, I am glad that I don't believe in such even though this day would be ruined by inevitable events. It is just having a strong GROUND and FOUNDATION of GODLY TEACHINGS and BELIEFS that would generate HOPE and OUTLOOK that everything happens for a reason at the right TIME --- in God's time.